After 34 years as a local non-profit promoting local architectural history, the Lawrence Preservation Alliance has achieved a history of its own. And what a history it is: a number of pivotal events in LPA history are also important moments in city history. Lawrence today would not be the same if LPA had not existed, and every day we work to ensure that statement continues to remain true. We reached out to the first president of LPA, Oliver Finney, and asked him to search his files and memory to write an early history of LPA. At LPA’s inception in 1984, there was no organized preservation effort in Lawrence. The Old West Lawrence Historic District was in existence, but there was no preservation ordinance, no Historic Resources Commission, and no Historic Resources Administrator. There was a strong sentiment among Lawrence leaders that individual property rights far outweighed historic or cultural concerns. If those early LPA Boards wanted to accomplish something, they had to band together and do it themselves (often putting up their own money), and they had to expect resistance. We are certainly glad that they did, and very pleased that Oliver has recounted these important historic events that follow. Thanks Oliver! Download a PDF of LPA Early History (1984-1990) here. An archive of photos, news clippings and other documents of the early history of the LPA is available in PDF format here: Vol. 1; Vol. 2. The restoration project for the Santa Fe Station will begin construction in late February and continue through late October 2018. The project is being administered by the Kansas Department of Transportation and First Construction of Lawrence will be the general contractor. The project will consist of exterior and interior repairs, improvements to ensure accessibility in compliance with the Americans with Disabilities Act, new roofing, solar panel installation and HVAC improvements. Questions regarding the project can be directed to David Cronin, City Engineer, at 785-832-3130/dcronin@lawrenceks.org. The Lawrence City Commission voted unanimously Dec. 5 to list five properties on the Lawrence Register of Historic Places. One, at 2110 Harper, was nominated by the Douglas County Commission. The other four were nominated by LPA in partnership with the property owners. These four properties are part of a larger LPA initiative to document and list significant local properties that were not listed on either the local, state or national registers. In May 2016, the LPA Board allocated $5,000 to fund the project. One property, at 819 Avalon, was listed on the Lawrence Register later that fall, and has since been listed on both the Register of Historic Kansas Places and the National Register of Historic Places. Four other project properties were recommended by the Historic Resources Commission (HRC), to be listed on the local register in November, and await a final determination by the City Commission in early 2018. 1645 Louisiana, an Italianate home built in the early 1870’s on 96 acres owned by Benjamin Akers, was part of a first-class horse breeding and training facility that included a racetrack near what is now 19th Street. That acreage is now the University Place Neighborhood. 645 Mississippi, built for Jacob House’s son Robert in 1918, is a prominent example of the Prairie Style, which is quite rare in Lawrence. 1509 Massachusetts is an excellent example of the Mission Revival Style, also rare in Lawrence. It was built in 1913 for H.B. Ober, who owned a prominent downtown clothing store. 200 Nebraska is a Mid-Century Modern built in 1955 for the Harold Zimmerman family. Members of the Zimmerman family owned and operated Zimmerman & Sons Hardware (now Cottins), and Zimmerman Steel Co. Selected by the local group Lawrence Modern as one of its Baker’s Dozen, this structure was designed by Warren Heylman, who went on to a highly decorated architectural practice in the Pacific Northwest. The City Commission has voted to give preliminary approval to add five properties to the Lawrence Register of Historic Places. The LPA was honored to work on four of the nominations, including the Lee Zimmerman House, pictured. We'll share more about these properties in the coming weeks, but for now, cheers to all those that helped make this happen! LPA recognizes two older properties where new owners performed whole-house rehabs using a sensitive and sensible touch. Congratulations everyone! Amanda Loughlin, National Register Coordinator for the State of Kansas, will hold a workshop at Lawrence Public Library on Monday, Nov. 6 at 1:30 pm on how to write a successful nomination for the National Register. Loughlin will provide insights into how to research and complete the nomination forms. The workshop may be of interest to those who own historic homes or business buildings or those who have interest in having a church or historic site placed on the state or national register. Buildings on the state or national register may be eligible for state tax credits. The workshop is free, but advance registration is required. There is limited seating. To register, contact Jan at JShupertArick@Douglas-County.com, or at 785-330-2878, by Oct. 31. More information is available here. Stephen Prue, Baron Hoy, LPA President Dennis Brown and Caroline Wiseman. Many thanks to the more than 60 people who toured Haskell Indian Nations University with us on Sunday, Oct. 1. 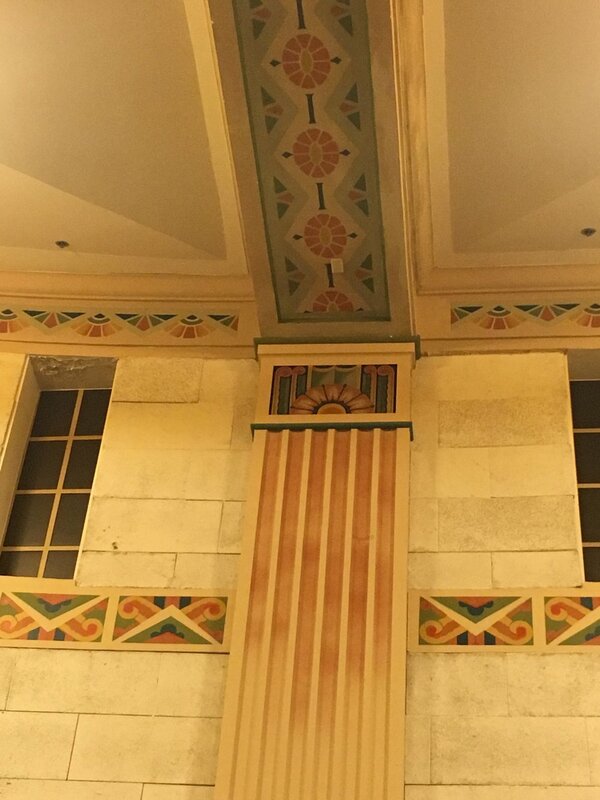 And special thanks to our excellent tour guides: Stephen Prue, Caroline Wiseman and Baron Hoy, who took us around campus to point out and explain the many historic buildings, beginning with the famous Haskell Stadium arch and including the fantastic Art Deco Haskell Auditorium. Photos from the tour, which preceded the LPA annual membership meeting, are in the gallery below. Great news from Haskell Indian Nations University: A new roof has been put on Hiawatha Hall, a big step toward saving and reviving this historic building, the oldest on campus. Please join us on Sunday, Oct. 1, at 1:30 for a walking tour of Haskell, passing by Hiawatha Hall and many other significant buildings, followed by the LPA annual meeting. Details are here.